The Ars Electronica festival in Linz, Austria has already enjoyed a long history and is once again open this September. For this 2016 edition, Artistic Director Gerfried Stocker has organized it around what he considers a sort of alchemy of our time, interconnecting bits to atoms, and hence the immaterial to the material. The exhibition ‘Cyber Art’ of the Offenes Kulturhaus Linz ends with the beginning in that the last room is dedicated to the critic and curator Jasia Reichardt, who obtained the Golden Nica prize for visionary pioneers this year. For it was she, in 1968, who organized the first exhibition dedicated to the fusion of art and technology. 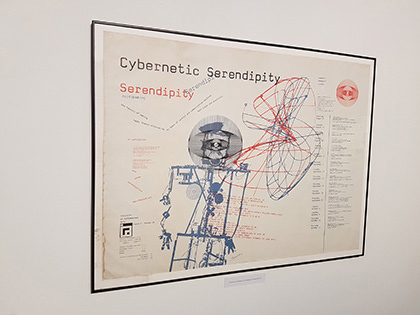 At the Institute of Contemporary Arts where the exhibition ‘Cybernetic Serendipity’ was being held, her aim was "to present an area of activity which manifests artists' involvement with science, and the scientists' involvement with the arts". Considering today the fifty years of exploration that ensued, her thinking at the time was extraordinarily visionary. Without omitting the next Nemo Digital Arts International Biennial of the Ile de France region in 2018 whose theme will be: ‘Chance, accident or serendipity’. In London, in 2014 and during the reactivation of ‘Cybernetic Serendipity’ through documentation, Jasia Reichardt reminded us that "people were very excited seeing that exhibition, it was a revelation but, what would be a revelation today"? Regarding the media arts, there is also a pioneer in France who specialized in the late 1970s in theorizing about the practice of exploratory video. Her name is Anne-Marie Duguet and this year she accompanies Masaki Fujihata in Linz as she is devoting the sixth opus of her collection of digital archives on contemporary art, ‘Anarchive’ to him, following Antoni Muntadas, Michael Snow, Thierry Kuntzel, Jean Otth and Fujiko Nakaya. 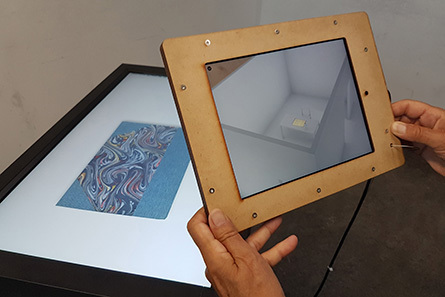 The Japanese artist, on this occasion, is reactivating one of his interactive installations titled ‘Beyond Pages’ using a tablet. The circle is thus complete because the original work features a digital book that could, virtually, already turn pages and that also made it possible to light a lamp in the physical space. This historic piece from 1995 is of a rare poetry for those who were lucky enough to experience it. But it also prefigures the use of tablets today to access content as services. It is precisely with one of these tablets that we revisit this work with the technology of yesterday, resolutely foreshadowing contemporary uses. And finally, it is worth mentioning that the next ‘Anarchive’ will be devoted to American artist Peter Campus. 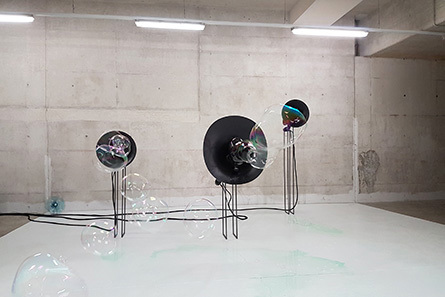 In the basement of Post City, which was formerly used for postal sorting, there is an exhibition dedicated to the ‘Alchemists of our time’ where we discover in particular, the sound installation ‘Black Hole Horizon’ by the Berlin artist Thom Kubli. It is by heading towards the distant sounds of fog horns that we reach them. They are three in number, creating soap bubbles that float towards the spectators and viewers who move about to further preserve their existence. The instrument is majestic and the composition random. In solo mode, the horns respond to one another to sometimes sound together. The spectacle of these autonomous bubbles represents a range of frequencies of variable duration and relative strangeness, that all brings us back to our childhood. The notes are visually maintained well beyond their sonic expression with machinery whose complexity we want to continue to ignore. In the air, they have the materiality of their membranes, which couldn’t be more ephemeral. Evanescent, these audio-visual entities punctuate the performance of their programmed disappearance. The work ‘Chozumaki’ by Nelo Akamatsu has much in common with that of Thom Kubli since it is still a sound system whose components include three flared containers. The scale, however, distinguishes them as the different pieces of the Japanese artist are miniature. Made of glass, they appear as fragile as the high notes, which are almost inaudible, that emit from them. 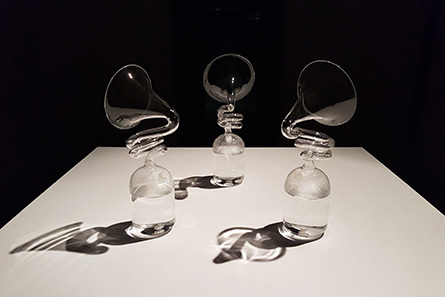 The show is played within three bottles where we detect vortexes in the transparency of a pure water, without understanding how they are generated. In a few steps then, we have switched from the monumental to the miniature to observe various micro-phenomena. Qualified as vortexes in physics, they remind us of the possible disturbances in the infinitely large, in space and time and in science as in fiction. Privileged witnesses of these few experiments over time, we understand in approaching the ear to these glass containers that we perturb their state. Just as in science, in which there are many experiments where the mere presence of an observer is enough to influence the results. But we also know, in reference to Marcel Duchamp, that "it is the viewer who does the work." 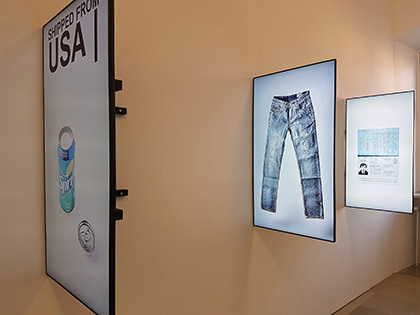 Back at the Offenes Kulturhaus in Linz, we discover the video documentation of the performance ‘Random Darknet Shopper’, with which members of the Swiss duo !Mediengruppe Bitnik received an honourable mention in Interactive Art. In 2014, they activated a robot with the delicate task of randomly buying items on the darknet, where essentially, everything is for sale. And the application, with a one-hundred-dollar bitcoin budget per week, proving itself by having delivered somewhat unexpected objects on the site of the exhibition of the Kunst Halle Sankt Gallen. But this robotic performance was eventually stopped by police seizing, in particular, a few pills of ecstasy and a false Hungarian passport. This of course poses questions as to responsibility, in an artistic context, of an autonomous robot in an era where robotics are multiplying. For online as in the physical world, we must increasingly interact with virtual robots or autonomous machines. In the meanwhile, artistic actions anticipate those of the legislators! Lastly, still at the OK (Offenes Kulturhaus) in Linz, there is a piece by Mat Collishaw. 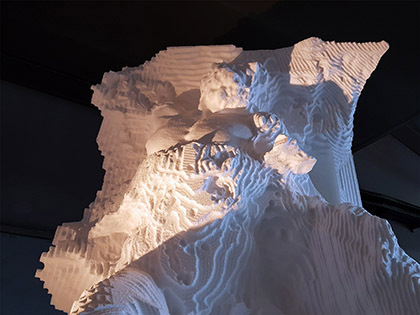 The latter, of the generation of Young British Artists, also received an Honourable Mention in Interactive Art for his light installation ‘All Things Fall’, which is situated at the intersection of painting, film, sculpture and digital. 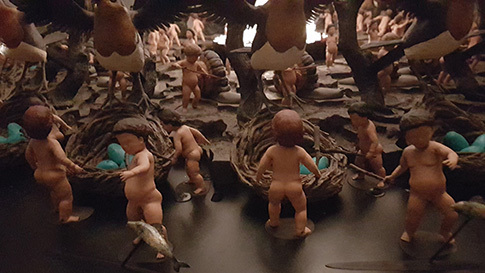 The theme is the ‘Massacre of the Innocents’, whose horror has been depicted by painters, whereas the device used evokes the zoetropes that largely participated in the writing of pre-film history. As for the sculptural aspect of the work, it is inextricably linked to the use of digital as the numerous figurines have all been modelled before being printed in three dimensions. When it is stopped, in the dark, we discern a precision that we know is mechanistic. Then, the zoetrope’s stroboscopic light, with its false likeness to a children’s carousel, reveals the true horror of these short plays at its optimum speed of rotation. The speed eradicates the details, so consequently all that remains is the terror. Written by Dominique Moulon for Art Press and translated by Geoffrey Finch, September 2016.